“S.Pellegrino is brilliant, lacking in any distracting odour, with a fairly dense perlage of reasonably fine bubbles in abundance. The immediate impression on the taste buds is one of tingling freshness, followed by moderate acidity that stimulates salivation, while the high mineral content leaves a pleasant aftertaste. For its unique properties, nowadays S.Pellegrino enjoys International renown.” Giuseppe Vaccarini, Best Sommelier of the World 1978. Performing a water tasting means committing all of the senses to classifying its merits and flaws through systematic analysis. 1. First assessment of freshness: once you open the bottle, pour the water in the appropriate glass and take a generous sip. 2. Visual analysis: raise the glass to eye level and then lower it so as to observe the water from above. Horizontal and vertical evaluations of the water will help identify any foreign particles or abnormal colours and lost effervescence of the sparkling water. 3. Olfactory approach: raise the glass up under your nose and breathe in deeply several times with your eyes shut if possible to get the best olfactory responses. 4. Gustative analysis: take a sip and allow it to rest on the tongue, and then distribute it throughout the mouth. Allow the water to slide in the back of the tongue, and swallow. This will allow you to evaluate acidity, sapidity, structure, lightness and mouth feel. An amazing richness of epicurean experiences with water promises to surprise every gourmet customer. Sipped in succession with wine, the minerals, texture and acidity of bottled water could influence its feel and enjoyment. This complementary process is called harmonizing. 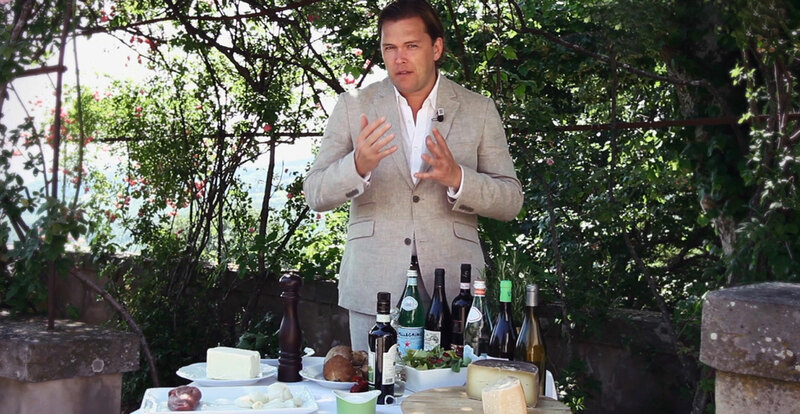 Food and wine interact to impart different taste characteristics through each other; the water is meant to cleanse the palate to enhance the interacting traits of food and wine. It’s fundamental that the flavour of the water, wine, or food should not prevail one over the other. S.Pellegrino water is meant to be paired with full-bodied wines rich in tannins and high in acid so that the two liquids do not impose on each other. And foods of strong substance and flavour should be paired with water and wine of these characteristics. 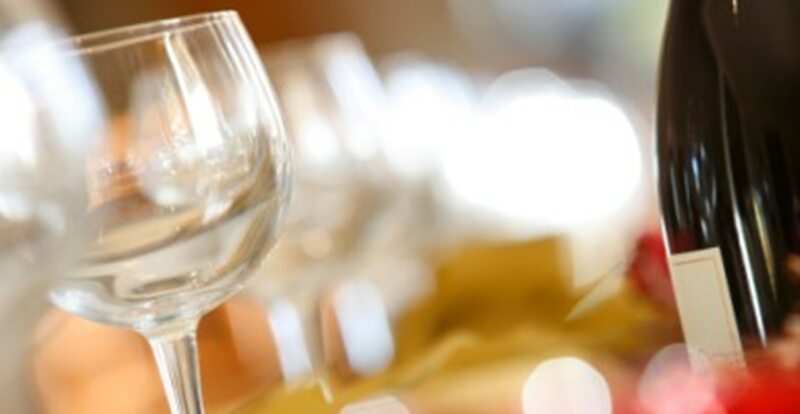 The choice of mineral water for a perfect dining experience is essential, and there is an increasing awareness in choosing the correct water, especially at the fine dining level. 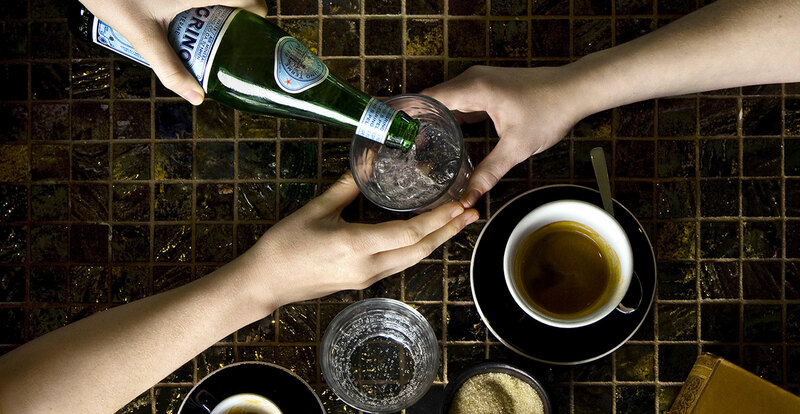 Its selection can intensify the enjoyment of the overall dining experience: the right water seamlessly complements the food and other beverages. Water tasting and water service are truly fine arts. Important and detailed guidelines on what and how to choose when pairing water, wine, and food, are recorded in the Water Codex, an ambitious cultural research and information dissemination project (in three volumes) undertaken for the first time by S.Pellegrino and Acqua Panna, under the direction of Giuseppe Vaccarini, Best Sommelier of the World 1978. Here are few important guidelines to follow ─ at home or at a restaurant ─ for a perfect water serving. Two different water glasses may be used, one for still and the other for sparkling water. They should be positioned above the place card or above the napkin, and distanced from wine glasses. The water should be presented in a clean and intact original glass container and not decanted into a carafe, to avoid the loss of some of its organoleptic (taste?) properties. 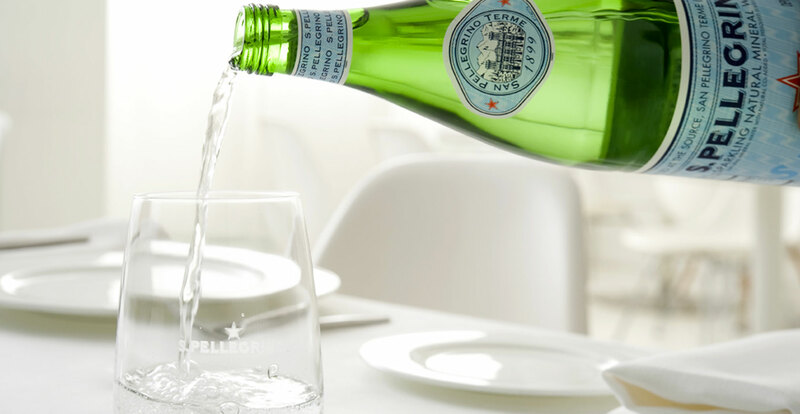 The proper serving temperature for S.Pellegrino is 8-10°C and the glass should ideally have a narrow rim, to hold back the carbonation bubbling and to control the flow of the liquid onto the taste buds for a greater feeling of freshness. As such, this retaining of taste complements and balances wines with high alcohol and tannin content.